Eight & Bob has launched Annicke, a new trio of fragrances for women. Annicke 1 ~ "The ﬂoral purity of lily of the valley matches fully with accords of jasmine and white musk." Additional notes include ivy, mandarin, peony, cyclamen and driftwood. 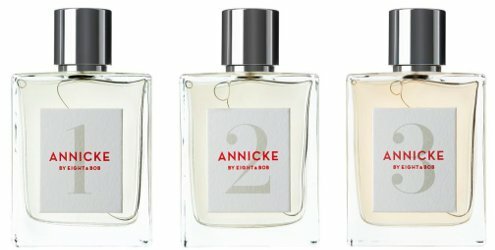 Annicke 2 ~ "A new expression of sublime tuberose with unexpected accords of immortelle and ylang ylang." Additional notes include mandarin, fig, hazelnut, cedar, sandalwood and vanilla. Annicke 3 ~ "A chypre ﬂoral fragrance with a creamy white ﬂoral heart of gardenia and jasmine." Additional notes include bergamot, mandarin, red berries, rose, meringue, cashmeran and sandalwood. Eight & Bob Annicke 1, 2 and 3 are available in 100 ml Eau de Parfum. No. 1 sounds right up my street! When I’m in London in Nov I might drop by a stockist to see if I can give these a sniff. My good friend Marion (I’ve mentioned her on here before, including a probably over-long story about her & Mugler’s Aura!) loved the original Eight & Bob when I introduced her to it in Roullier White a few years ago & told her its origin & story. How she went from it to Aura is a mystery to me – but then again, as I’ve also documented here, she’s been worn down by years of trips which have included visits to various locations so I can satisfy my interest in ‘smellies’ & despite herself, has become quite interested too! You will convert her yet! I’m working on it, Robin! To be fair, Marion is now more interested than she ever thought she’d be, possibly because she doesn’t have to succumb to a ‘hard sell’ given she can rely on my knowledge if she has a question about a particular fragrance/house/history (not that I want to blow my own trumpet!). Not sure how many ‘smellies’ related venues Marion & I will get to during our Nov London trip, but if I buy the earrings in the Lalique shop I saw when I was there in July I’m sure the lovely people there will shower us with samples like they did last year when I also bought earrings! Ha, I would think so! Hope it is a good trip regardless. Thank you. We always have a great time – going to the season end ATP tennis tournament this year at the O2 venue for the first time, after many, many years attending the ‘oldies’ tournament at the Royal Albert Hall.